Monin puree pump - for dispensing the perfect amount of puree - 15ml per pump. Only for use with Monin purees or 1.89L Monin sauces. Insert dip tube into body of pump. Unlock the pump by holding the body of pump and turning the nozzle clockwise. 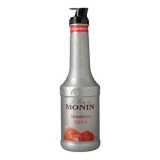 Insert into a Monin puree and screw on tightly. Depress a few times to charge the pump. Pump will be damaged if put into a dishwasher. The pump should be cleaned regularly by hand and must be cleaned when using on with a new bottle of puree. Unscrew pump from the puree bottle. Pull dip tube from body. Wash all parts in warm soapy water and rinse carefully with clean water. Shake pump parts to eliminate excess water and allow to dry.